If you’re a travel enthusiast in India, Ladakh has to feature high on your list of must-see places and we are no different. Because of its remote location and tough terrain, Ladakh is best enjoyed in a group and it requires a week at the very least. Hence, it had remained on our to-do list for far too long. So when an opportunity to go to Ladakh turned up, albeit with a relatively unknown group of people – we jumped at it. It’s another story that from the original planned 11-12 people, we ended up being only a group of 4, not that that reduced our enthusiasm levels. After a whole lot of planning, re-planning, shopping and packing, we were off in the first week of July. We had a long itinerary of 16 days starting from Mumbai > Delhi > Manali > Ladakh > Srinagar and returning by flight to Mumbai. After chilling for a day each in Delhi and Manali, we set out from Manali in an Innova early in the morning (4:30AM) to avoid the infamous traffic snarls on the way to Rohtang La. But turned out it wasn’t of much use because there was a broken down truck on the road, which stopped all traffic up to the pass for an hour. An hour we spent shivering in cold winds and having out first roadside meal of steaming maggi & chai – a meal which was to be repeated several times over the next two weeks. Once we reached the top of the pass, we saw our first snow of the trip and stopped for the mandatory snaps. The top of Rohtang Pass had snow on both sides of the road which attracts the hordes from Manali. 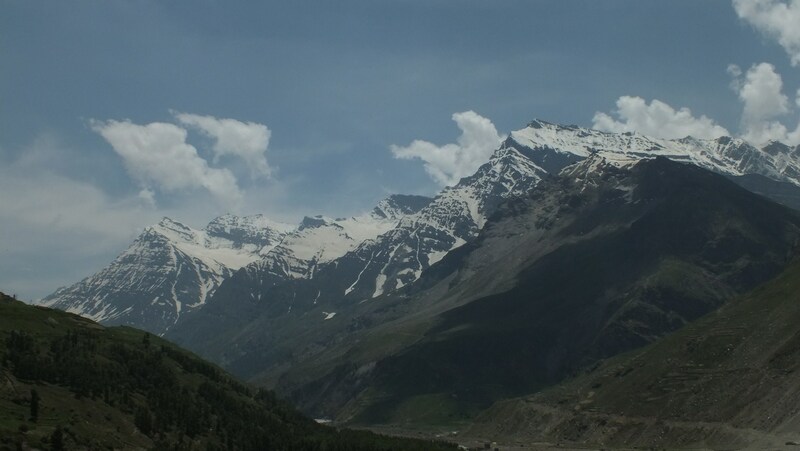 Once we crossed Rohtang La, the traffic almost disappeared, and we were treated to some beautiful views of snow-clad peaks as we climbed down from the pass. 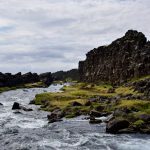 From the pass, the road was through river valleys flanked by mountains on both sides, covered with green specks and topped with snow. We reached Camp Jispa, our night halt, by around 3pm. Set on the banks of the Bhaga river (one of the sources of the Chenab river), it is one of the prettiest campsites ever. 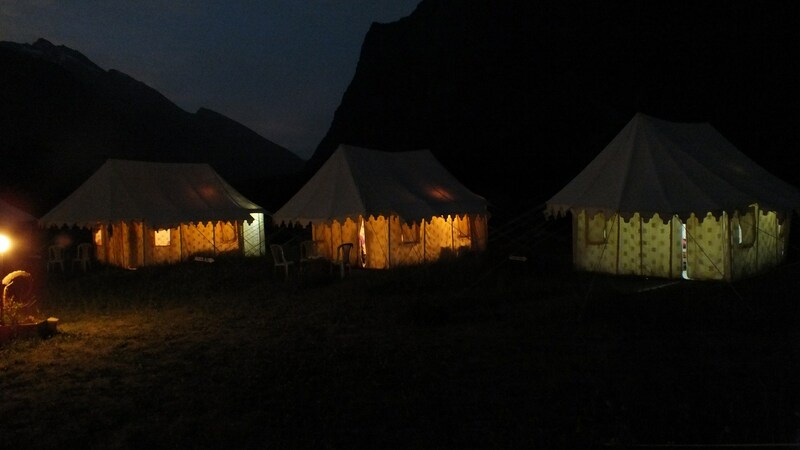 There were about 10-12 luxury tents, with attached baths, and we only had one Israeli couple for company. There are several more options for stay in Keylong, Sarchu and Darcha but we highly recommend Camp Jispa for a night halt between Manali & Ladakh – the tents are clean & well-fitted out, the staff is friendly, dinner was great and all this came at a very reasonable price (Contact: Sherab Gyaltsen, www.jispajourneys.com / jispajourneys@gmail.com/ +911902 254055). We explored the camp in the evening and a photo-op later, had an early dinner and settled in for the night, since we planned to have an early start again. The next day we had our first puncture (thankfully our last too), which meant an hour long breakfast (maggi & eggs – what else!) at Sarchu while the driver got the tyre fixed. The scenery on the second day was quite different from the first – it was more brown/grey and less green. 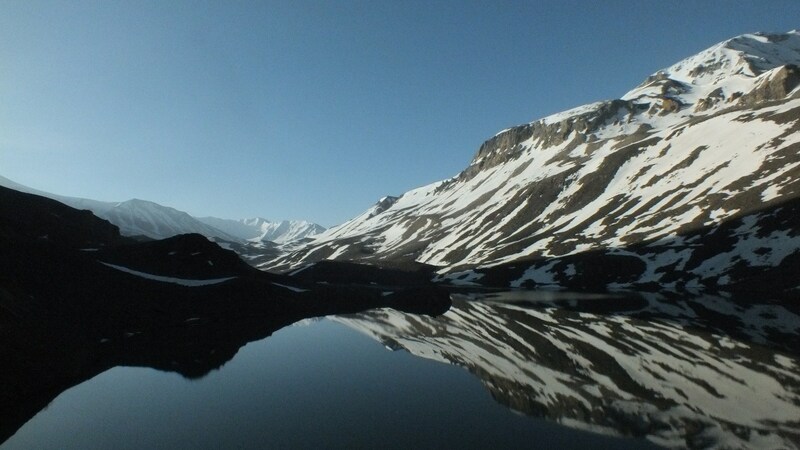 On the descent from Baralacha La, the road passes along Suraj Taal – a serene lake surrounded on all sides by snowy mountains. Suraj Taal (pic below) is part of Lahaul-Spiti valley in Himachal Pradesh and its beauty renewed our desire to travel to Spiti valley on our next jaunt. 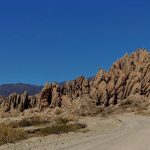 Next, we passed through Yunam valley, an area with interesting rock formations caused by wind-erosion, which reminded us a lot of the fairy chimneys in Cappadocia (Turkey). As the altitude kept increasing some of us started feeling a little nauseous and headache – which meant we didn’t stop for too long at Tanglang La (the second highest pass on our trip at 17,480 ft). After Tanglang La, the road turned terrible – if you are generous enough to even call that a road. We reached Leh around 5PM that evening and were thankful for the refreshing tea from our host at the guest house. We had booked rooms at Glacier View Guest House for the first couple of days. We ventured out only for a late dinner that night and stayed in bed a little late the next morning to recover from the two days of travel. Leh is a pretty, not-so-little town in the Ladakh valley which acts as the base for all the Ladakhi travellers. It is thronging with tourists (most of them foreigners) and as a result chock-a-block with restaurants, cafés and curio shops. Where it differs from other tourist cities in India is the people – what they say about mountain people is true and Ladakhis are the epitome of courtesy and friendliness. 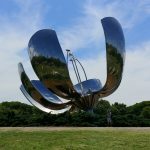 Since it is recommended that you spend at least a day acclimatising yourself to the high altitude, we spent a leisurely morning, venturing out only after lunch to check out some of the sights within the city. Our first stop was Leh Palace. Built in the 17th century, the Leh palace supposedly has resemblance to the Potola palace in Lhasa, Tibet. However, the palace is in quite a depleted condition today – mostly on account of the Dogra onslaught in the 19th century, which forced the royal family to abandon the palace and take refuge in the nearby Stok Palace. Tsemo Gompa is further up from Leh Palace. 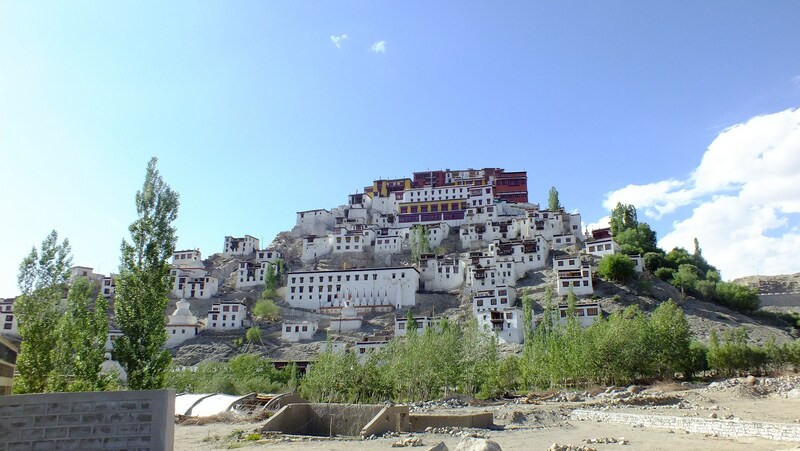 While there is nothing special in this monastery meant for the royal family, it is worth a visit for panoramic views of Leh and the surrounding areas with snow-capped peaks in the background. Our last stop for the day was Shanti Stupa, a white-domed stupa on a hilltop. It is the most famous site within Leh – both due to its religious significance and its location which provides sprawling views of the surrounding landscape. Nubra Valley, literally meaning valley of flowers, (different from the more famous Valley of Flowers in Uttarakhand) is 150 km away from Leh – but distances don’t mean much in this terrain and so it was a 6hr drive in our Xylo. The road from Leh to Nubra takes you via Khardung La – (not undisputedly) the highest motorable pass in the world at 17,580ft. We had our only snowfall during the trip at Khardung La and to celebrate we had some momos with spicy chutney at the “the highest café in the world”. By now we were all more accustomed to the altitude and didn’t feel much discomfort like we did in Tanglang La. The journey on the climb to Khardung La was scenic but almost monochromatic (the browns & whites of snow-capped mountains). But the downward journey was extremely colourful with the Shyok river flowing in the brown valley with pockets of green and yellow – villages with farmlands. The cameras were hardly able to do justice to the place. Our first stop at Nubra valley was at the Hunder sand dunes – yes sand dunes in the middle of the Himalayas with camels and everything! 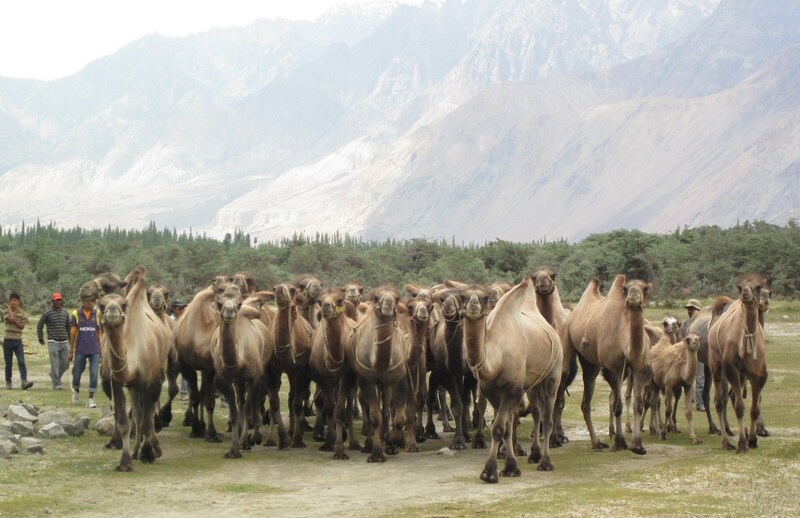 Hunder is home to a herd of Bactrian two-humped camels that were brought from Mongolia along the Silk Route. We took a 30 min ride on these camels (it’s not very comfortable to ride them and a longer ride would probably lead to sore bums). Next stop was the Diskit monastery. Reaching the monastery involved a lot of stairs but with nothing much at the top to reward you for the climb. 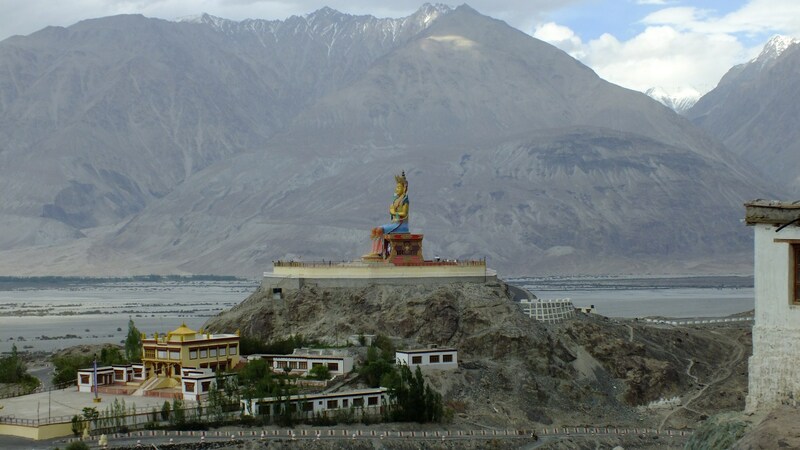 Diskit also houses a gaint statue of Maitreya (future avatar of Buddha) and offers some sprawling views of the Nubra valley. Our night stay was at Sand Dunes Guest House in Diskit (Contact: 01980 220022) which offered us clean, comfortable rooms and a nice hearty dinner. There are staying options available at Hunder and Sumur too. Next day, we headed to hot water springs at Panamik village. We had an unplanned adventure there as one of us got stuck in the quagmire-like slush surrounding the hot springs and a mini-rescue attempt had to be staged – first to get the person out and then to rescue the person’s shoes! After much laughing at the stupidity of it all, we proceeded to Sumur monastery. We were quite bored of monasteries by then and after a cursory look-see, we made our way back to Leh, for another evening of street-shopping and dinner at our favourite terrace-restaurant. It is a long journey from Leh to Tso Moriri (7hrs) and as usual we had an early start. The winding Indus river kept us company for much of the road to Tso Moriri and needless to say there were some spectacular sights along the way. We also saw some Himalayan Marmots – friendly, squirrel-like animals – found only in a small area of Ladakh. 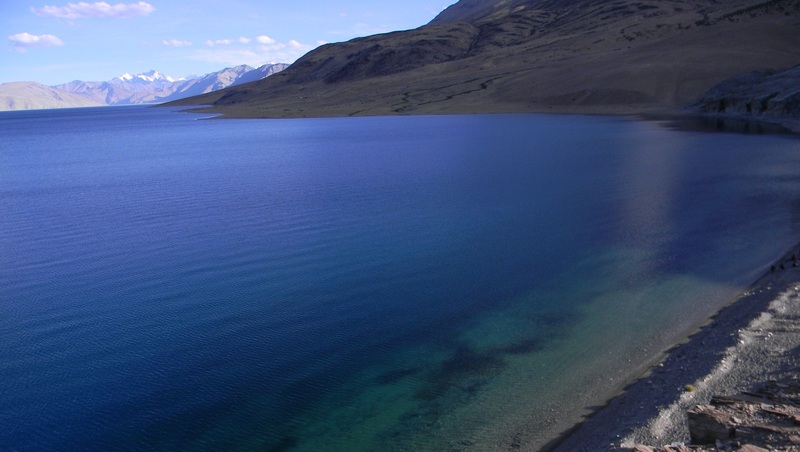 Just before we reached Tso Moriri, we came across Tso Kiagar (pic below), a much smaller saline water lake – it looked amazing and we wanted to spend time at the lake. However, the shore was full of some sort of flying insect which mobbed us when we tried to get out of the car. We quickly got back in the car and continued towards Tso Moriri, with a little disappointment. Little did we know that we had no reason to be disappointed, since Tso Moriri was infinitely more breathtaking and we would get plenty of time to spend on its shores. There aren’t too many options for overnight stay at Tso Moriri – couple of dingy-looking guesthouses at the Korzok village bordering the lake and a couple of campsites on the banks just outside the village. The campsites are the more preferred stay as the village smelled a little too strongly of livestock. The campsites on that day were in particularly great demand, since the road to Pangong Tso was blocked due to a landslide and all the tourists came to Tso Moriri instead. We quickly made staying arrangements for the night at one of the campsites and hurried to the lake. We spent about 4 hours on the lakefront from 3pm till sunset and the lake kept changing colours for most of that time – and we tried again and again to capture its splendour on our cameras with only moderate success. No words are enough to describe the beauty of the lake and all we can say is – experience it first-hand. We chose a secluded spot on the shore and pretty much had the entire place to ourselves. We ventured into the ice cold water to take some better pictures and after that just sat on the shore trying to etch the scenery into our memories. That night was the coldest in our trip and we had to spend it inside tents with cold breeze coming in from the lake. A hot dinner at the campsite helped us in settling in for the night, but not before we bundled ourselves in all sorts of warm clothes possible. The next day we spent a couple of more hours on the banks of the lake trying to soak in yet more colours of the lake in the early morning sunlight. And then we turned our heads back unwillingly towards Leh. 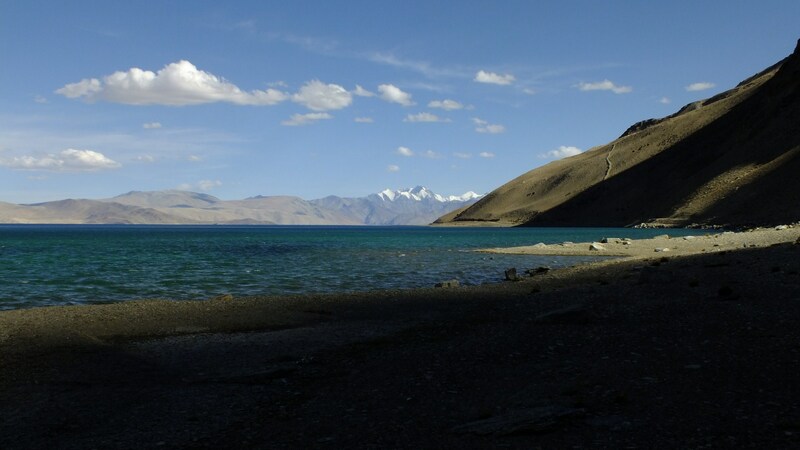 I must mention that on our way back, we barely glanced at Tso Kiagar, after having seen Tso Moriri in all its glory. 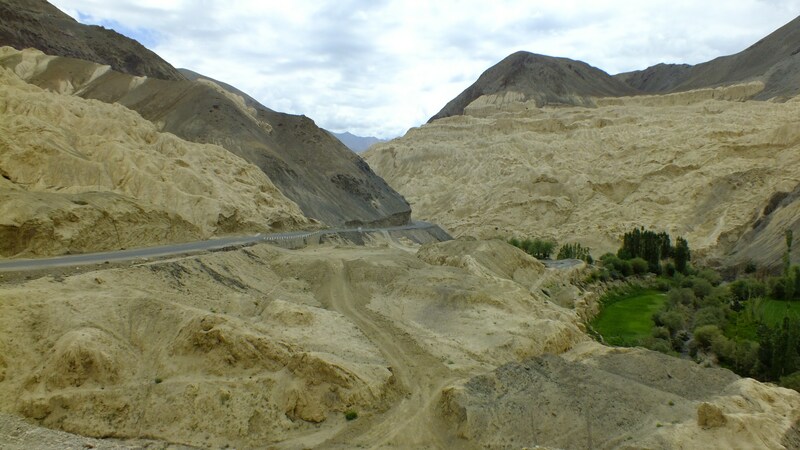 Our first attempt to reach Pangong Tso ended abruptly mid-way as a landslide blocked the road and we had to turn back. The roadblock took three days to clear up and fortunately we had enough reserve days in our itinerary to still accommodate Pangong Tso once the roadblock was cleared – though we had to cut short our two-day trip to a one-day trip. 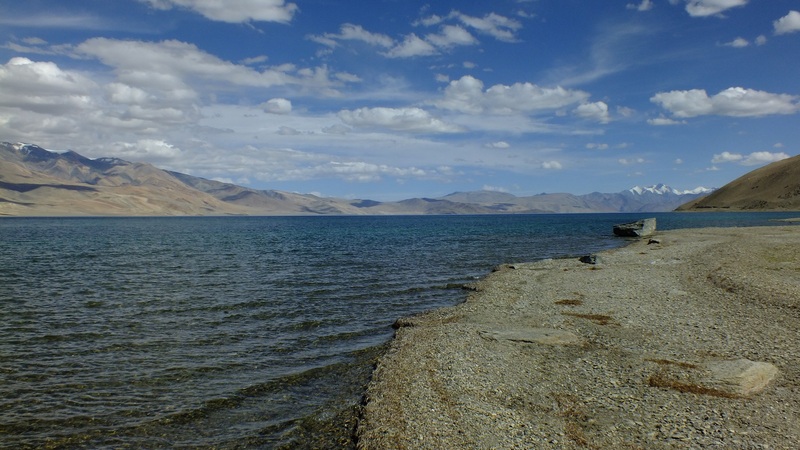 Pangong Tso is also 5-6 hrs away (~150 km) from Leh and after another early start, we reached there around 12 noon. 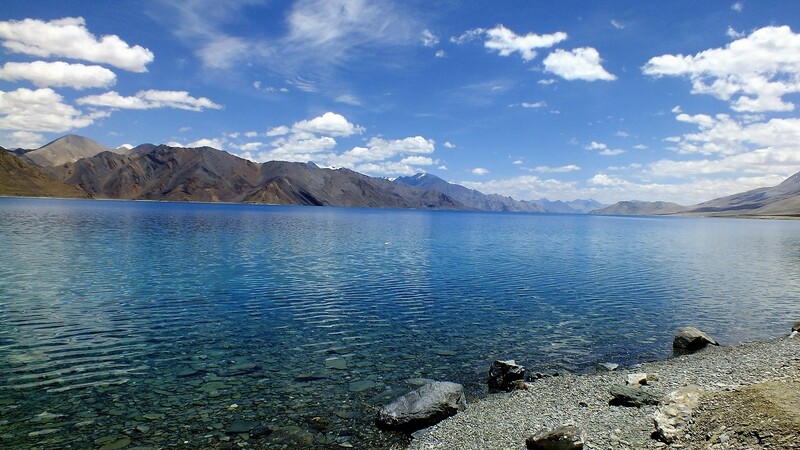 Pangong was a shade of blue lighter than Tso Moriri – maybe it was brighter that day. The clouds cast shadows on the mountains surrounding the lake making for an enchanting view. There were also migratory birds near the shores that were quite happy to eat biscuits offered by tourists (not sure if that’s a good thing actually). Tourist vehicles are allowed for only a couple of kms along the lake, beyond which only army personnel can go (the China border is around 15-20 km from there). 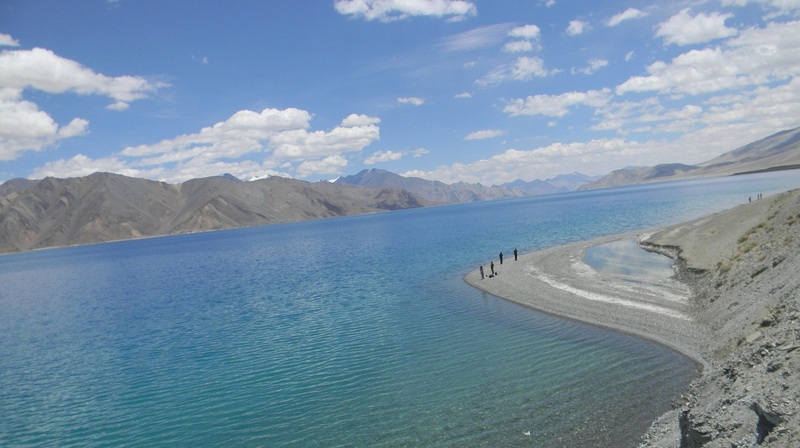 Between Pangong Tso and Tso Moriri, the former is the larger and the more famous one – its popularity helped by the movie 3 idiots whose climax was shot here. However, we found Tso Moriri more impressive than Pangong Tso – maybe it was the time of day or maybe it was because we saw Tso Moriri first – anyway we’re nitpicking here. Both are awe-inspiring and deserve to be on your bucket list. Also along with the popularity, a little commercialisation has creeped in and there are several dhabas & eateries, which weren’t there a couple of years ago. Thankfully, the area is still very clean and scenic. The lake is in the process of being identified under the Ramsar Convention as a wetland important for migratory birds and hopefully that will help in the lake maintaining its serenity and cleanliness. 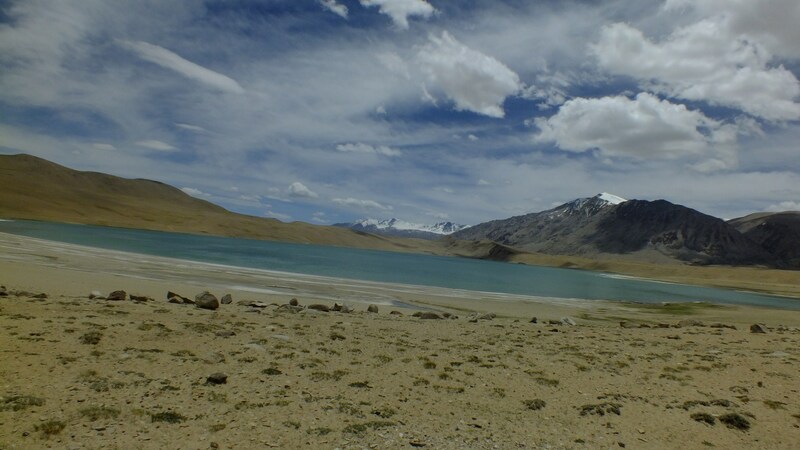 After a quick, not-so-good lunch at one of the eateries and a parting glance at the lake we headed back towards Leh. Monasteries abound in Ladakh and Thiksey, Hemis & Shey Palace are the more famous ones among tourists, partly due to their proximity to Leh. If you can’t spare a full day to visit them you can cover them on your way to & from Pangong Tso or Tso Moriri, like we did. The main attraction in Shey Palace (~15 km from Leh) is the large (two storey tall) copper statue of the Buddha. Thiksey monastery (~5 km from Shey) is probably the largest in Ladakh – it’s is a 12 storey complex which meant a lot of climbing. But it’s a beautiful monastery and was worth the climb. Hemis monastery (~45 km from Leh) is worth a visit for its striking murals depicting scenes from Buddhist mythology. On one of the reserve days we had in Leh waiting for the road to Pangong to open, we hired 2-wheelers – it was fun riding around and exploring Leh on our own. Stok Palace (15 km from Leh) is where the ex-royal family of Ladakh (the Namgyals) live and part of it is open for public viewing. It’s a little bit of an exaggeration to call this a palace – it’s more of an over-sized bungalow. Although it is pretty and well-maintained we won’t recommend a visit unless you have time to kill. 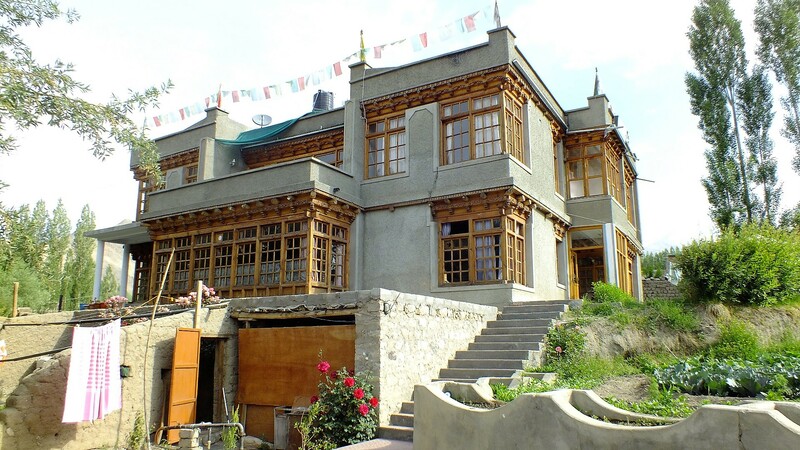 The palace also houses a nice museum on the Ladakhi way of life, Ladakhi history and history of the royal family – quite interesting if you have the time. If you do have time to kill, your time is much better spent at the War museum (or Hall of Fame). In fact we would insist you make time for this in your schedule. The museum has a truckload of information about the Indian army’s war efforts against Pakistan, especially the Siachen battlefield and we would be very surprised if you managed to go through the entire museum without some tears in your eyes. We bid a reluctant farewell to Leh and started towards Srinagar on NH1. But our trip wasn’t coming to an end – not yet. 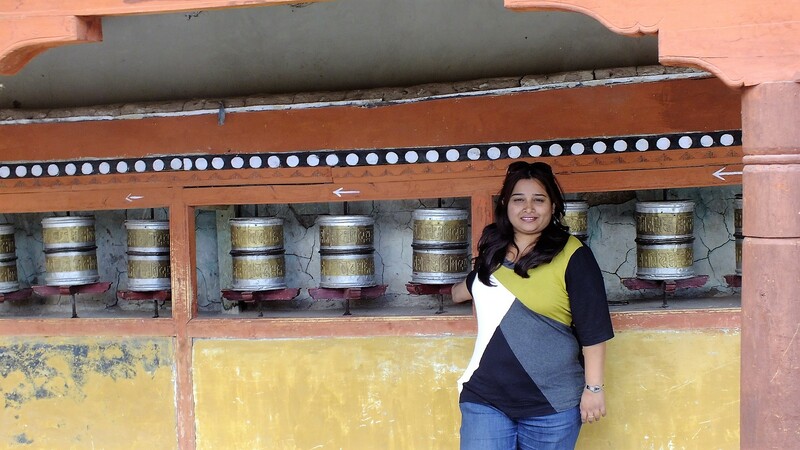 We had rafting, visits to couple of more monasteries and a day in Srinagar to reckon with still. Our 24 km & 2 hr rafting expedition on the Zanskar river started from Phey and ended at Nimmoo and took us through Grade 2 & 3 rapids and some fascinating sights. After the excitement of the rafting and lunch, we headed towards Likir and Alchi. Likir monastery had walls covered with beautiful paintings and also housed a gaint Maitreya statue, similar to the one seen in Diskit. The Alchi monastery is much older (10th century) and very different from all the other monasteries in Ladakh. In fact, the architecture is somewhat similar to South Indian style of temples. We were planning to spend the night at Lamayuru but midway between Alchi and Lamayuru we came across a lovely resort (Faryok resort, Nurla) with cottages facing the Indus river and on a hunch went and enquired the availability. We were lucky to get accommodation at a reasonable price since most of the cottages were unoccupied. 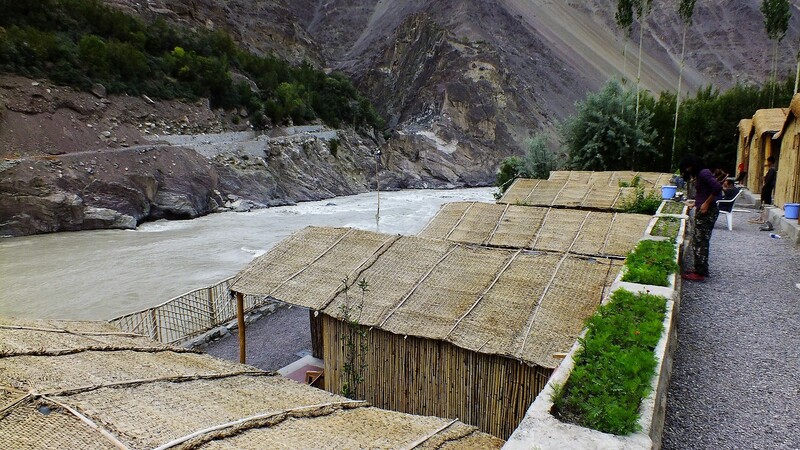 Apart from the pretty & well-equipped cottages, the resort had the added attraction of a wooden bridge across the gushing Indus river. It was a good place to put our feet up and relax for the night. Heading to Lamayuru the next day we passed through the moonscape – an unearthly looking region with weird rock formations coloured bright yellow ochre. Lamayuru also houses a monastery – frankly we were bored of them by now – but it did offer a spectacular view of the surrounding moonscape. We were supposed to spend the night at Kargil and drive to Srinagar the next day with a stopover at Sonmarg – but something about the town creeped us out. Added to this were the lack of clean, reasonably priced accommodation and our driver’s lack of enthusiasm to spend the night at Kargil. So we started for Srinagar at 4pm – it was a 6 hr journey (~200 km) and we knew we would reach Srinagar only late in the night. A delay in the road meant, we crossed the narrow Zoji La, another mountain pass, when it was pitch dark – which was quite thrilling (by which we mean, scary!). We reached Srinagar only around midnight and with our mobile phone batteries almost drained out we had a tough time finding our hotel, but we managed with the help of some army personnel and locals. 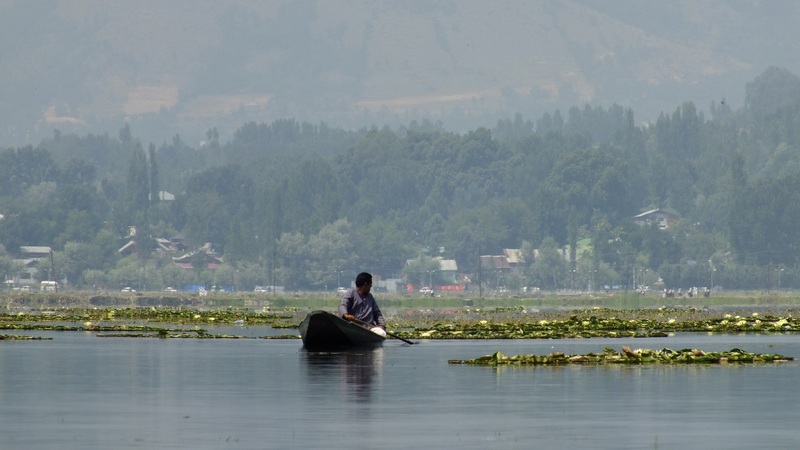 We spent just a day in Srinagar and did all the usual touristy things – a boat ride on the Dal lake, a stroll in the Mughal gardens, shopping for Kashmiri suits & dry fruits and a quick visit to the Hazrat Bal. We will leave writing about Srinagar for when we do a more leisurely trip to the Kashmir valley. Do take a well-stocked medical & first-aid kit, including medicine for altitude sickness. 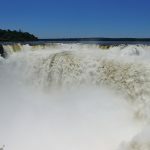 There are several lists available on travel websites and forums on what all should be taken – some are a little too extensive. Decide using your own judgment. Read up about altitude sickness/acute mountain sickness and take a call on how likely you are to be affected by it and take necessary precautions. We decided to take half a Diamox every day for the first 5 days, starting from the day we left Manali. As per new rules (from 2011) commercial vehicles hired from anywhere outside Ladakh (including Himachal Pradesh, Delhi and Kashmir) are only allowed to drop travellers to Ladakh and cannot take travellers around Ladakh. So if you’re travelling from either Manali or Srinagar to Leh then you will have to book a vehicle for only one-way travel and take a separate vehicle in Leh. It is better to book the travel vehicle for Manali to Leh on reaching Manali. Talk to a few travel agents in the market area. We hired an Innova for our 2-day trip from Manali to Leh (one-way) for Rs 17,000 and were quite satisfied with the vehicle and the driver (Contact: +91 9418070940/+91 9469522776). The other option for Manali to Leh is to take the HPTDC bus which charges ~Rs2.5k per person and takes 2 full days – cheaper but more inconvenient option. We used the services of Markha Tours & Travels run by Mr. Tashi (Contact: +919419242664 / +919622995457), who made arrangements for our transport in Ladakh and drop to Srinagar from Leh in a Xylo. He also helped us out with accommodation in Leh since we had bookings for only the first couple of nights. He along with our driver (Gyalson / +919469375460) had a big part in making our trip truly memorable. Mr. Tashi is easily one of the best travel agents we have ever dealt with, with a perennial smile on his face and a solution to every problem we had. Gyalson, our young driver, was a cheerful Buddhist who was ready to go the extra mile for us, literally. The vehicle rates for trips to different places from Leh within Ladakh are standardised and published by the Leh Taxi Union. You can find it at http://leh.nic.in/pages/Taxi-list.pdf You can bargain for a discount of 10-15% on these rates. 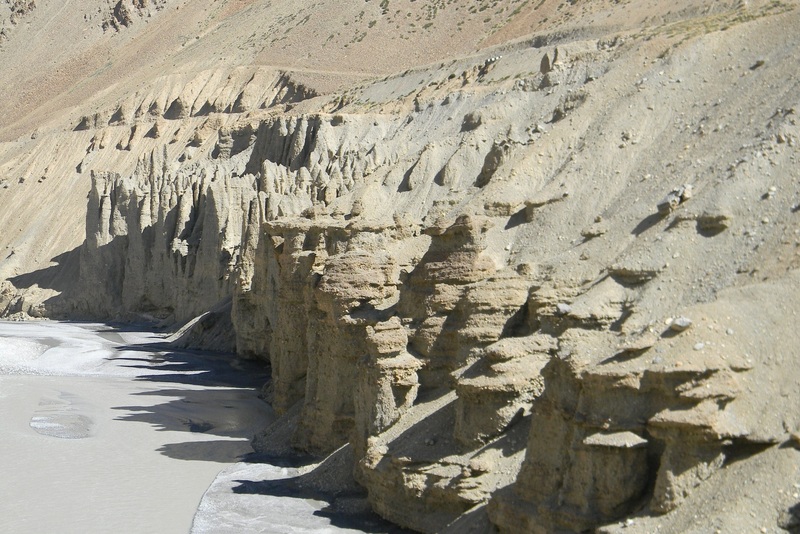 Inner-line permits are required to travel to Nubra Valley, Pangong Tso and Tso Moriri. Your travel agent/driver/hotel can arrange for the same or you can get them done yourself. You need an ID and photo to get these permits done and they will cost you ~Rs 500 per person for all three of them (don’t remember the exact amount but it’s not very high). When it comes to food you’ll be spoilt for choice in Leh. Several multi-cuisine restaurants, cafes & bakeries abound. And when we say multi-cuisine, we don’t mean the usual Mughlai/Indian Chinese found in other tourist destinations. They serve proper pizza, pasta & continental food, along with N Indian food. Once, you step out of Leh however, you’ll have to make do with momos (yum! ), thukpa & maggi or dal/chawal/roti – simple fare served hot and we couldn’t really complain. 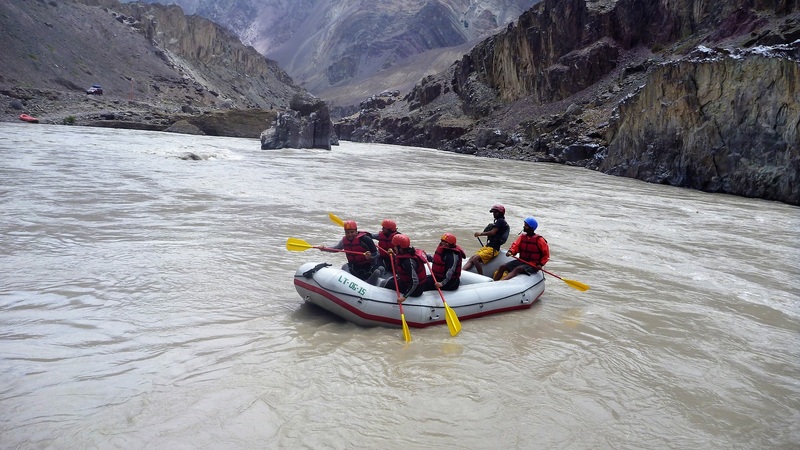 There are several options for rafting in Ladakh – ranging from a couple of hours to 2-3 day trips. We settled for the 2 hour version on the Zanskar river. 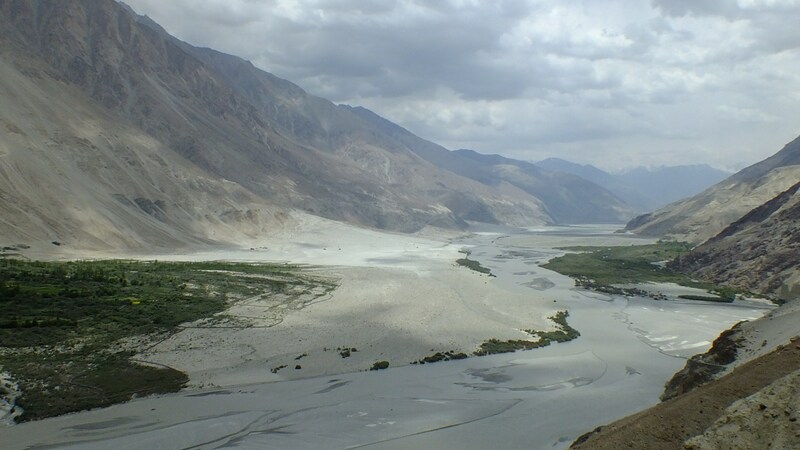 Nimmoo (28 km from Leh), where Zanskar and Indus rivers meet, is the hub of rafting in Ladakh and most rafting expeditions either begin or end at this place. You can make arrangements for rafting by walking into any of the travel agencies on Changspa road. Accommodation options in Leh are numerous – from the 3-star hotels to the a-few-hundred-rupees-a-night guest houses. The hotels are probably more your style if you expect room service and a staff at your beck & call. But if you’re ready to forego of those, the guest houses (homestays really) run by Ladakhi families offer a much more charming and value-for-money option. We settled for the mid-range guest houses – costing between Rs 600-800 per night for clean rooms with attached baths (there are cheaper options also available with shared bathrooms). Some of them even offer home-cooked breakfasts and dinners – which is icing on the cake. We spent 7 nights in Leh – three of which were in Nathu La Guest House, run by a really friendly middle-aged couple. 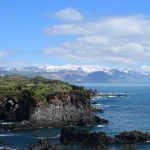 We loved their hospitality and the rooms were clean, comfortable and reasonably-priced. Do consider them if you are looking for the real Ladakhi experience. Unfortunately, we don’t have their contact number but Mr. Tashi can provide that to you. We were quite happy with Glacier View Guest House (pic above) as well (Contact: 01982 253503), where we stayed a couple of nights. If opting for guesthouses, pick something on or within walking distance from Changspa Road. It is a thriving street filled with cafés, bakeries, restaurants and a lot of tourists. Ladakh is a sparsely populated region which cannot support a big population on the region’s own resources. Hence, accommodation outside Leh tends to be of the bare basic variety. While some villages in Nubra Valley are perennial and some shelter can be found even in the winter season, campsites near Pangong Tso and Tso Moriri are temporary settlements which wind up and vanish in October. These places are a hundred miles away from electricity and piped water. But camp operators still manage to provide generators and setup temporary bathrooms and provide piped water. And this comes at a high cost. It is not uncommon for camp operators to ask up to Rs 4,000 a night (meals inclusive) for a 2-person tent in peak season (for instance, check out any of the campsites on campsofladakh.com). And once you realize the difficulties in running the campsite by transporting everything – diesel, food, LPG cylinders etc – continuously for the tourist season, the costs seem quite reasonable. However, if they have unsold tents, they are willing to give it at far cheaper rates to people on first come first serve basis. We managed accommodation at Tso Moriri for less than half the price quoted for advance booking (inclusive of dinner & breakfast). The same thing worked in our favour at Faryok resort on the way to Lamayuru. The trick is to not make bookings beforehand and reach the destination early – we reached Tso Moriri by 1pm. But this implies that if by chance you get stuck in a remote location without accommodation then you should be ready to stay the night at one of the houses of the locals for a few hundred rupees. If you’re not ready for that, then book in advance and pay the full rates.